Jeff Bryman was born in Philadelphia, and received a degree in Economics from Temple University, a law degree from Villanova University, and a Master of Laws (Taxation) degree from Villanova in 1988. He resided and practiced in Bucks and Montgomery Counties until 2001, and has practiced in Chester County since then. Jeff became associated with Brutscher, Foley, Milliner, Land & Kelly, LLP of Kennett Square, Pennsylvania, in 2008. Jeff is admitted to the Pennsylvania Bar and is also admitted to practice before the U.S. Courts of Appeals for the Third and Ninth Circuits and the United States District Count for the District of Arizona. Jeff is a member of the Pennsylvania and Chester County Bar Association and the Stively American Inns of Court. Jeff’s areas of practice include civil and commercial litigation, real estate, contract law, insurance law, wills and trusts, and probate. Also, Jeff has worked for many years in the areas of commercial leasing and financing. Jeff has written course materials for the Pennsylvania Bar Institute and Pennsylvania Land Title Institute and is a course instructor for those organizations. 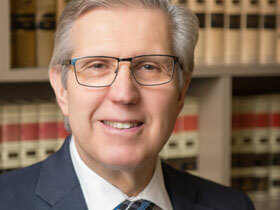 He is a past Chairperson of the Tax Section of the Bucks County Bar Association and past Chairperson of the Subcommittee on computerization of the Bucks County Law Library. Jeff is a member of the Greater West Chester Sunrise Rotary Club, and serves as Club Secretary and as member of the Board. Jeff and his family moved to Chester County in 2003 and reside in Birmingham, PA. They enjoy hiking, bicycling, kayaking and skiing.